Offering complete and in-depth data and information on plastics extrusion, this practical handbook presents the technology of the subject rather than the theory. Presents an overview of extrusion technology as applied to the operation of extrusion systems and the design of tooling and equipment for use in the process. 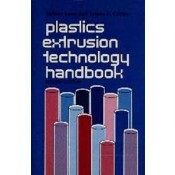 Provides basic technical information on the behavior of polymer and plastics materials in the extrusion process. Contains tool descriptions that provide a basis for the analysis of existing product lines as examples for the design of new systems. Includes illustrations of and background material on control systems for the extruder and extrusion process. Fundamentals of the Extrusion Process. Extruder Design, Construction and Operation. Extrusion Dies for Specific Product Lines. Controlling the Extrusion Process. Heat Transfer and Heat Content Considerations. Downstream Equipment and Auxiliary Units for Extrusion Lines. Coextrusion and Dual-Extrusion Technology. Extrusion of Cellular Plastics Products. Extrusion System Design and Integration. On-Line and Computer Control of the Extrusion Process. Plant Design and Operations. Extrusion Products and Processes. Glossary. Index.